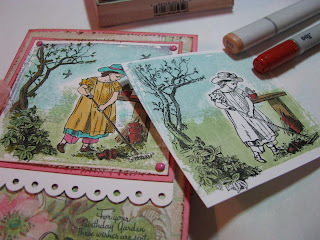 I could hardly wait for cardmaking to turn to spring and summer themes, because I bought the cutest little Unity "Birds of a Feather" stamp set last winter. 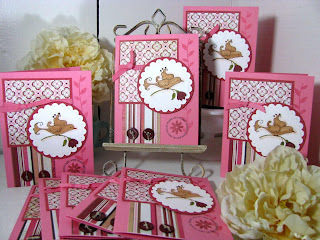 Finally I am cranking out flowery cards with these sweet little birdies! This weekend I came up with this layout because I only had 1 sheet each of this Basic Grey "Bittersweet" Hand Dipped & "Praline" paper. I was on a mission to see how many cards I could get off of 2 sheets of patterned paper! I reversed my scallop circles on this one to give a different look for the focal point image. I sort of like the scallop on the white paper for a change, instead of always using it for the mat! 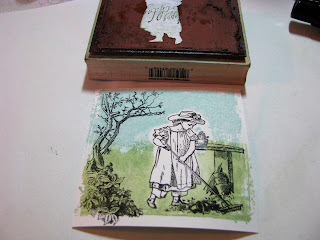 I pulled out my FAVORITE circle sentiment set from Papertrey/Pinefeather Press (Around & About Sentiments), and then used it to stamp thank you, happy birthday and get-well soon! So now I have all-occasion cards, from the same batch of bird cards! 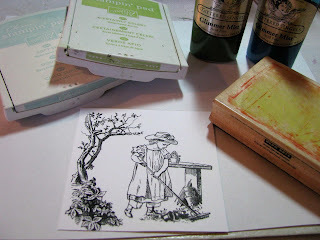 I also used Pine's "Beyond Basic Borders" to stamp a faint pink vine in the background going down the edge of the paper. I cranked out close to 16 of these cards with 2 sheets of 12 x 12 patterned paper! Man, I'm a thrifty girl, eh? Oh man, those Tattered Angels girlies have created a monster here. 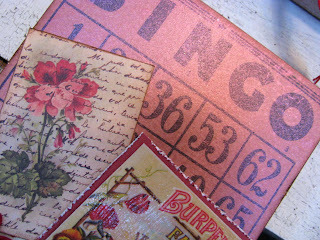 While I was experimenting with different ways to use Tattered Angels Glimmer mist, I decided I wanted to try it on my favorite cardboard BINGO cards! And not just the CLEAR glimmer mist, the COLORED stuff! 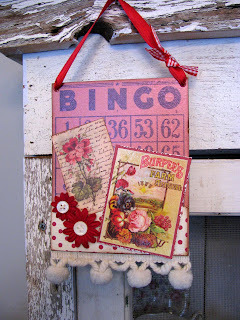 I had some vintage bingo cards that were cardboard with BLACK numbers, and decided I could spice them up a bit with Vintage PINK glimmer mist! 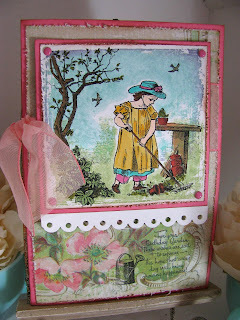 I gave the card a few sweeping spritzes with the pink mist, let it dry and then gave a few more spritzes, and a FEW MORE! And I got this gorgeous deep pink glimmery color from it! 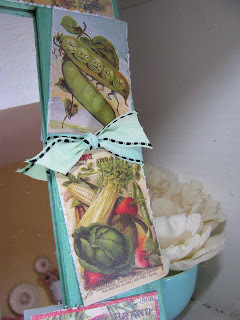 Then I added some seed packet and floral images from Crafty Secret's new "Garden" Scraps. 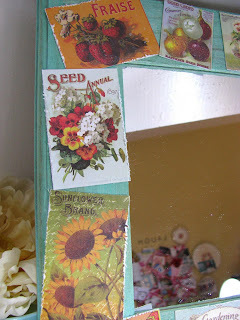 I coated the seed packet with Ranger Crackle glaze so it has a shiny, crackly texture to it. Here's a close up of the shimmer! 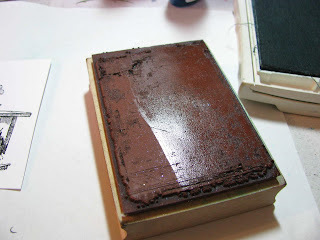 I also took distress ink and went around the edges of the Garden Scraps to dirty them up a bit. Hope everyone has a great weekend! YAY FRIDAY! 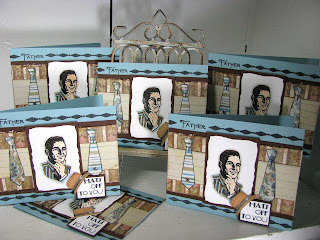 Tonite I have another project that I did for the Crafty Secrets/Tattered Angels "March Mix" challenge. 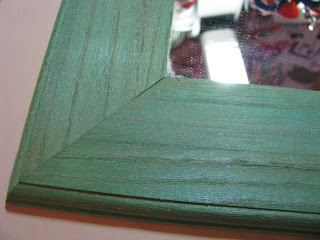 I found this unfinished wood mirror at Michaels or Crafts Direct for a dollar or so, and had it in my project cabinet. I pulled it out and was going to paint it, and then I thought, HEY! I wonder what glimmer mist would look like on the raw wood! 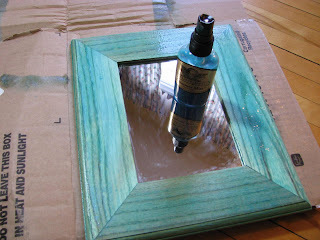 I laid the mirror down on some cardboard and spritzed away with Tattered Angels "Patina" colored glimmer mist. 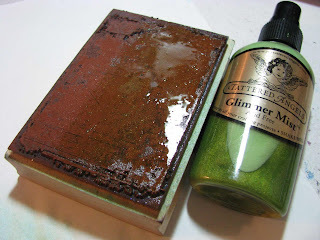 I was SO thrilled that the glimmer mist covered beautifully, and brought out the woodgrain! 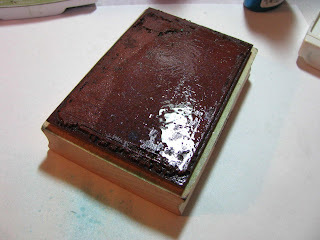 Because it's water-based, the color soaked right into the wood and left a cool shimmery coating! Click on the close-up here, to see the wood frame up close. Look at the shimmer it left! 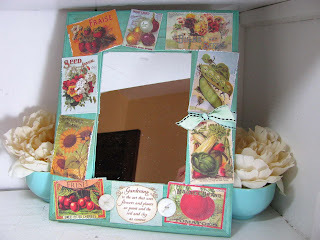 Then I took images from Crafty's new "Garden Scraps" (these images are printed on a heavy cardstock), and glued them to the front of the frame with mod-podge. After everything was dry, I gave it another coat of a clear 'pearl' colored glimmer mist. I also had some white Bazzil stitched ribbon that I had bought at Archivers in their $1.99 section, and spritzed the ribbon with the glimmer mist too! The color soaked into the ribbon, so now my ribbon color matches my frame perfectly! 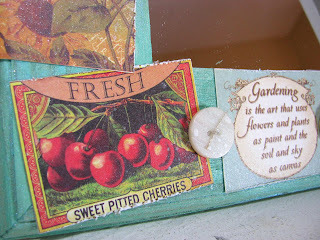 Here's a close-up of some of the cool images from Crafty's Garden Scraps sheets. I have one more project I couldn't resist doing; I made a BINGO card! More to follow! Happy MONDAY morning to everyone! Today is my birthday and I have the DAY OFF! No one should have to work on their birthday, so I took a day of vacation! YIPPIE! 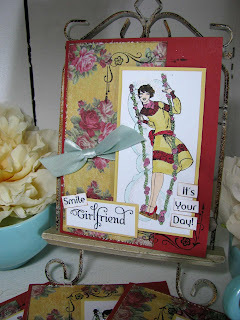 Today I have a tutorial for you for the Crafty Secrets/Tattered Angels March Mix challenge, that has been going on all month. We have teamed up with the Tattered Angels design team to create some fun projects with Crafty Secrets and Tattered Angels products! 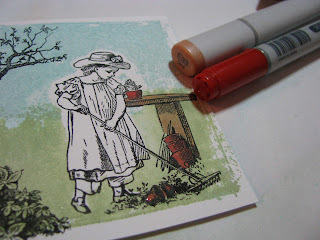 I first have to tell you that I was COMPLETELY inspired by Anna Wight's card HERE; her beautiful watercoloring inspired me to pull out Crafty Secret's "Garden Girls" set and try my hand at coloring these beautiful spring girl images. Anna is a master at watercoloring, so I'm not even going to ATTEMPT to copy her, because I do not have the skills! But I wanted to show you guys a cool, easy technique to get a great 'expressionistic watercolor' type background, that is easy and simple for a beginner or novice to accomplish. Stamp off your images onto white cardstock. I always use Neenah Solar White now, for everything I do. I used Brilliance Black Ink and then heat-set the ink with my heat gun. (Brilliance is a waterproof ink...important because we don't want the black ink to bleed.) 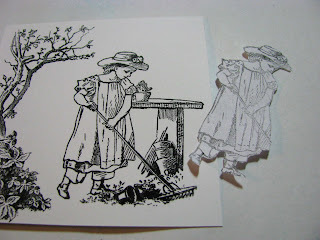 I also stamped off another image on copy paper for my 'mask' & cut it out. I'm not going to worry about the trees or the rest of the images, just my focal point, which is the girl. Place your mask over the girl. This will protect her from getting waterlogged. Let's start with the sky. Take your blue ink (SU soft sky) and ink up part of the background block. Now lightly 'spritz' the Patina-blue colored glimmer mist across the block. Stamp the block across the top of your image. Your paper will curl slightly; take your heat gun and run it across the paper until the glimmer mist dries. Now do the same thing with the celery green ink. Ink up the block, then spritz Honey dew-green colored glimmer mist. Stamp it onto the bottom half of your image. Take the heat gun and run it across your image again. Your sky and grass will have a cool shimmer to it! I think you may be able to see it if you click onto the next photo and look at the close-up (you can see the glimmer and how Copics will cover over the top of the glimmer misted bench and pots. Now take your Copic markers and color your images in! I used "Sand" color for the potting bench and brown (E08) for the clay pots. Continue coloring your images until a bright and beautiful scene evolves! My favorite dark brown Copic for trees is "Light Walnut", and leaves are done in Spring Dim Green. Dress colors are "Buttercup Yellow & Golden Yellow". 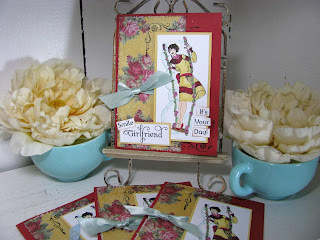 Plus, there are grand finale give-aways on the Crafty Secrets and Tattered Angels blogs! Stop over and get entered to win some great products! Today I finally finished another huge box of samples that I'll be sending off to Crafty Secrets for scrapbook store samples! 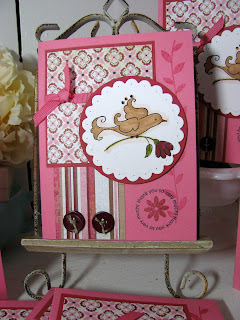 These are based on a card I made a while ago when the Crafty Secrets Glamour Girl set first came out. 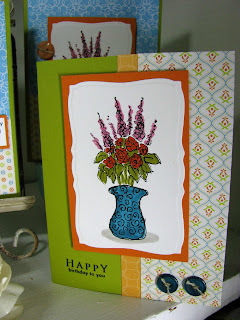 I used a yellow rose-patterned paper from Crafty's Radiant Paper pad, to make the card summery and bright! It was beautiful here in Minnesota again, so I spent a lot of time outside today, enjoying the warm weather! I feel the spring cleaning urge coming on; I want to clean my house from top to bottom! WHY does that happen? It's been a crazy busy winter and I feel like I want to take a breather, re-group, and go into the spring with a fresh start! Treat Yourself - Life is Sweet! Oh man, I cannot WAIT for summer! It's been so so nice here, I can't help but think that it's a big joke and we're going to get 72 inches of snow soon. I have SPRING fever in a BIG way! I went out walking again tonite and then came home and got a craving for ice cream. It may be because I colored 10 of these Our Craft Lounge ice cream sundaes! I headed to Aldi because they have a great selection of low-calorie ice cream bars called "fit and active". 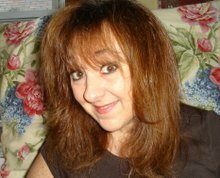 I got 110 calorie orange dreamcicles and some 50 calorie fudge bars & dove into one tonite. Craving averted! 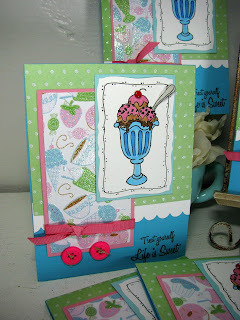 I paired the ice cream sundaes up with some new Die Cuts with a View patterned paper from a "kitchen" paper pack that I got on my last paper binge from girls scrapbooking weekend. These papers are glittery too! If you click on the close ups you can see the shimmer! 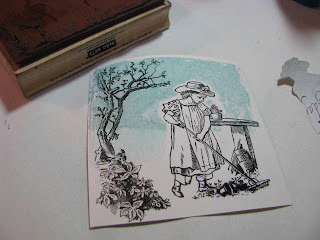 The cute stamp is from a OCL set called "Life is Sweet". 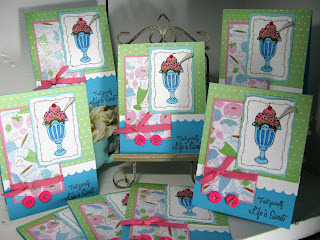 I cranked out shimmery birthday cards for my stash and just finished them last night. Hope you're having a SWEET week! Hats off to you, Father! Well, we made it through another Monday, and here in Minnesota it was 67 degrees! It feels like SUMMER here! I had to get outside and do a 3-mile walk because it was so beautiful out! 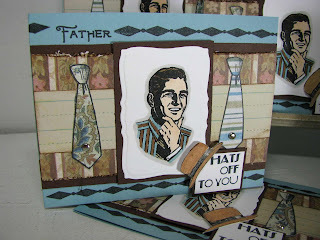 Here's another project I worked on this weekend; I made 25 sample cards for Father's day using the Crafty Secrets "Favorite Fella's" stamp set. These samples will probably go out to stores that sell Crafty Secrets products, for display with Crafty's stamps. I paper-pieced some funky ties from patterned paper from Crafty's paper pads. I also fun-flocked the hat in brown so it looks like felt and has a great texture! Also, Crafty Secrets has teamed up with Tattered Angels this month and the design team is pairing up products from both companies to create shimmery eye candy! 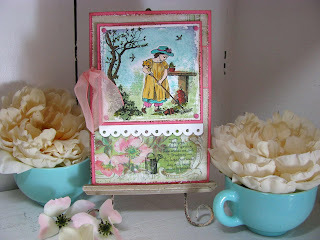 Check out these blogs for the latest projects posted for this fun March challenge! I just have to thank you guys for sticking with me the last 6 months, while I've been uploading everything to the Dirty Dozen gallery and neglecting my blog here! I'm happy (and sad) to say that my 6 month gig with the DD is finally over at the end of this month! It was so much fun; but all good things must eventually end. I feel a big pressure off my shoulders; it's hard to try to keep up with the talented girls over there! So my focus now is going to be back on my blog, and replenishing my neglected card stash. I have been dying to play with this Inkadinkado Rock Star stamp set that I bought at Michaels um, approximately 6 months ago? 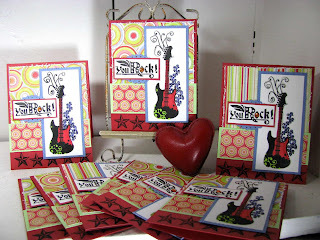 I used it in a dirty dozen gallery but wanted to make a ton of rockstar cards to have in my stash. FINALLY I got to crank some out this weekend. I got into trouble at Archivers with the girls a few weeks ago and bought this funky My Mind's Eye Penny Lane "Feeling Groovy" patterned paper that felt perfect for this guitar. 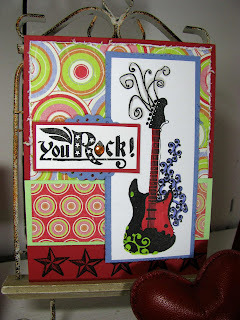 I added an orange gemstone in the "O" to add some rockstar bling to the card. Hope everyone had a great weekend; spring is on it's way! YIPPIE! My brain is on overload! I'm back from Indianapolis and FINALLY blogging again. My brain has been on overload for the last 2 weeks; I guess that's what happens when you work 12 days in a row without a day off! I have been stamping this week, but all of my energy went into finishing up my Dirty Dozen projects and I am finally DONE! 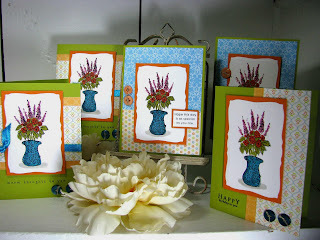 In between my Dirty Dozen projects, I putzed on these simple "thinking of you" and birthday cards, done with Our Craft Lounge's "Flowers for You" stamp set. The layout is nothing fancy or elaborate, but the simple background papers draw your eye to the big vase of flowers. I finally got to use my large rectangle nestabilities dies, because the flower arrangement fit just perfectly on it! 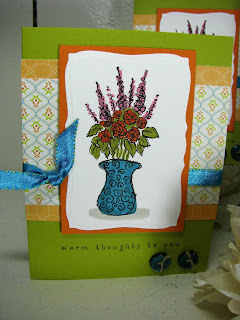 I pulled out some old favorite sentiment stamps from Hero Arts and Papertrey (faux ribbon set) for the sentiments to coordinate with this vase. The papers are my new favorite DCWV Citrus stack again. Hope you all are having a great week...let's celebrate, it's the WEEKEND! I *know* I've been a slacker blogger lately but I'm having a major crunch time again right now, so I don't have a lot to show you! Last weekend we had a girls get-together at Archivers, and I spent most of the evening chatting with the girlies and cranking out these Crafty Secrets "Feeling Yucky" cards. I cranked out 25 of them, which will eventually be sent to Crafty Secrets to use as store samples for the new Feeling Yucky stamp set that was just released at CHA. The little ducky on the front carrying the flowers is cut out by hand! AYE CARAMBA! I also cut out tiny bandaids to paste on the edge of the image for an accent. 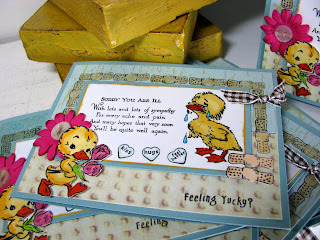 I used the chenille paper from Crafty's Pastel paper pad to make the card look cozy and snuggly, to comfort our poor sick ducky! 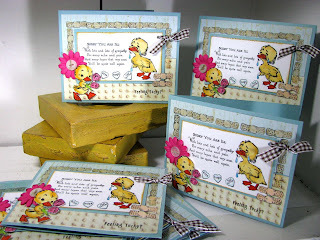 The inside reads "Hope you're soon feeling just ducky"! I am heading out to Indianapolis for work this weekend, so I probably won't be able to post again until next week. Hope you have a great week and are feeling just 'ducky'! I've been so GOOD lately. I know the economy is in rough shape and my 401K is in the toilet. I've cut back unnecessary purchases, put money in savings, eaten lunch at home every day and skipped the girls trip to Puerto Vallarta. 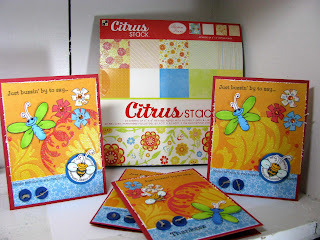 And this weekend I fell off the wagon; foiled by the Citrus Stack by Die Cuts with a View. I couldn't help it; we were in JoAnn Fabric and it was a girls stamping weekend, and all the paper pads were 50 percent off! You can't blame me, right? I guess I just needed something fun and bright to cheer me up. I fell in complete love with these bright, glitterfied papers! 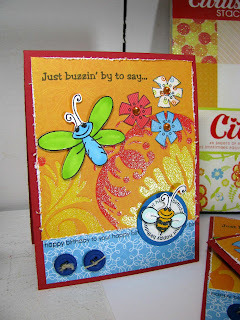 I came home and paired the papers up with the new "Just Bugz" spring set by Our Craft Lounge. I stamped off a bunch of flowers on different patterned papers from the paper pad, and cut them out for little embellishments for my cards. The paper is glittery, so I took the opportunity to bling up the flower centers with orange rhinestones, lest they be left out of the glitter celebration! I used Pinefeather Press's (Papertrey) Around and About sentiments to circle the bee and ran a Happy Birthday sentiment across the bottom. So my 401K is still tanking and Puerto Vallarta is a distant memory, but at least it's sunny in my stamp room!